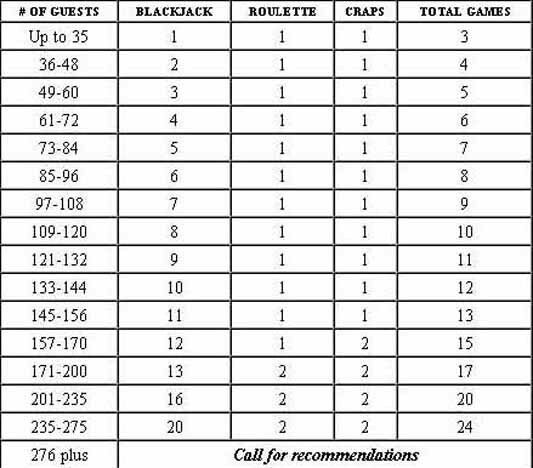 To help in the planning of your casino party, use the chart below to determine the types of casino tables and quantities that On the Go Casino® Inc. recommends for your casino party. The above casino party table chart is intended as a guideline to help determine the type and number of games for your casino party. Simply find the approximate number of guests you are planning for in the far left column. As you look right from that number you will see our suggested game tupes and quantities based on your guest count. We realize not eveyone at your casino party will play so our suggestion will accomodate approximately 70% of your guests to be playing at the casino tables at any given time. Example: You expect 100 guests at your casino party. In the far left column that number falls between 97-108 indicating our suggested table game types and quantities are 7 Blackjack, 1 Roulette and 1 Craps. This set up would allow for approximately 70 guests to be playing at any given time. We will assist you in the design and placement of all tables and games. The following guidelines will help you plan for the space you need. The space includes room for the dealers, players, equipment and walking area. We are extremely flexible and can usually work a floor plan around any space limitations you may have. Large Craps – 12ft x 4ft and require approximately 120 square feet per table.